You can save at least $100 by flying to Dubai with Royal Jordanian Airlines this April, thanks to our deal hunting team. Travel to the United Arab Emirates on April 8 and return on April 15, 2014 and pay only $854 r/t including taxes. For booking this flights you also get over 13 thousand award miles, about 1/3 of a free flight from Europe to the US. Search for the airfare in the box below – note that we have found this offer on Travelgrove – by comparing the prices of different providers. Who knows? Maybe you will dig up an even cheaper Dubai flight! Take a look at the screenshot below to get to know all the details of this Royal Jordanian Airlines flight. There is 1 stop each way, both times in Amman, Jordan, layover time on the way to Dubai is rather long, 15 hours and 15 minutes – enough even for a little sightseeing, while on the way back you only have to wait about 1 hour and 20 minutes. The Middle Eastern airline offers the cheapest flight to Dubai by far. The next best airfare deal is nearly $100 more expensive as you can see in the table below. 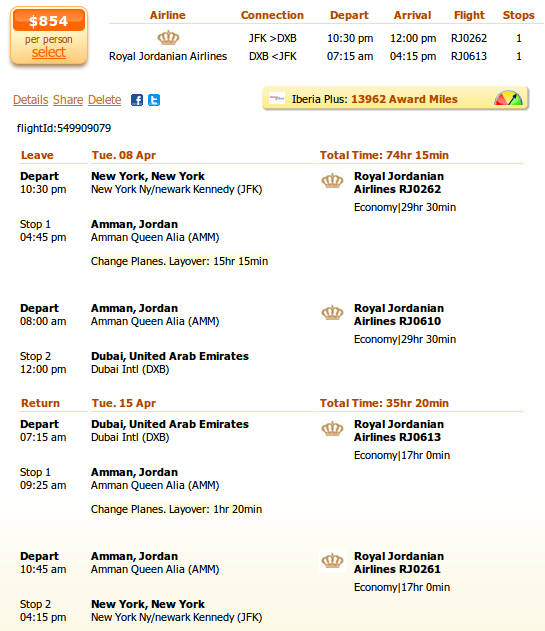 Check out the table and then use the search box to find the Royal Jordanian offer before it sells out! This entry was posted on Monday, February 10th, 2014 at 7:43 am and is filed under Airfare Deals. You can follow any responses to this entry through the RSS 2.0 feed. You can leave a response, or trackback from your own site.